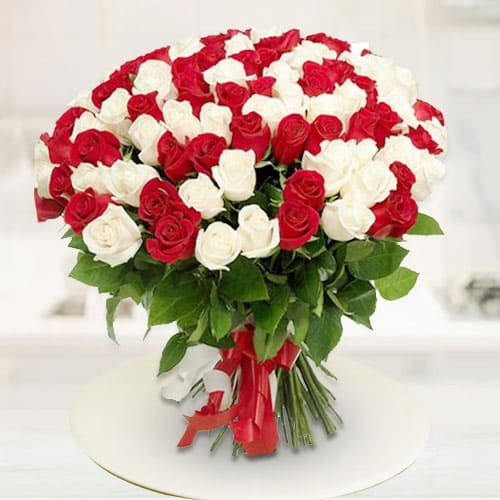 Order this Divine Charm Red N White Roses Premium Bouquet for your partner and kindle up the forgotten-for-work romance which thrives 24*7 between you two. This Duet features Dynamic Red and White Roses tied together by Nifty Ribbons and enhanced with Leaves of Color Green. Pick this Glowing Marvel 100 Red N White Roses Assemblage to greet the novel bride of your family and tie with her through floral radiance. This Assemblage presents Vibrant Red and White Roses combined together by Chic Ribbons and further decorated with Green Leaves.